AGS Hong Kong was announced on March 26 as ‘Most Reliable Relocation Service Provider 2014’ in the prestigious ‘Most Valuable Services Awards 2014’ by Hong Kong’s Most Valuable Companies (HKMVC) – a Mediazone publication. 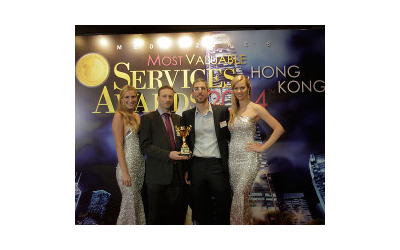 AGS Movers Hong Kong was announced on March 26 as ‘Most Reliable Relocation Service Provider 2014’ in the prestigious ‘Most Valuable Services Awards 2014’ by Hong Kong’s Most Valuable Companies (HKMVC) – a Mediazone publication. Factors recognised by the Editorial Board of the Mediazone Group (MZG) included AGS’ quality certifications; contributions to Hong Kong and China over the last eight years; overall quality and value of services; and devotion to quality in staff training. said AGS Hong Kong Branch Manager Gregory Seitz upon receiving the award. According to figures released by MZG, they annually invest in excess of $5 million into research and analysis. Regular internet-based polls include more than 30 mainstream industries, providing accurate data for use by HKMVC. CAPTION: AGS Hong Kong’s Branch Manager, Gregory Seitz and Trainee Manager, Elliot McMahon, receive the award for ‘Most Reliable Relocation Service Provider 2014’ in the ‘Most Valuable Service Awards 2014’.